As a marketer, if you want to earn consumers' interest, patronage, and long-term loyalty, you need to ensure that their online interactions anticipate and address their needs, as expected. Today, delivering on audience expectations means enabling them to engage with your business on their terms–whenever, wherever, and however they want to connect. And, increasingly, those consumers are relying on mobile devices–phones, tablets, wearable devices, and the like–for their inquiries and explorations, as well as to take action on the information they find. Want proof of just how essential it is for marketers to deliver stellar mobile experiences? A Pew Internet study found that 19% of Americans who own a smartphone have limited or no other high-speed Internet access. And a "micro-moments" report from Google even found that 82% of smartphone users consult those devices to gather information about purchases they’re about to make –while they are already in the brick-and-mortar store. What are the top frustrations that users experience when browsing on mobile? These busy consumers rely on your website for information, and a poor experience could drive them right into the arms of your competitors. If your digital experience isn’t designed with a mobile-first approach, you are being negligent of their needs. It used to be enough to just say your website was workable for mobile viewing: As long as users could pinch, zoom, scroll, and squint to get your page to fit their smaller screens, your job was done. 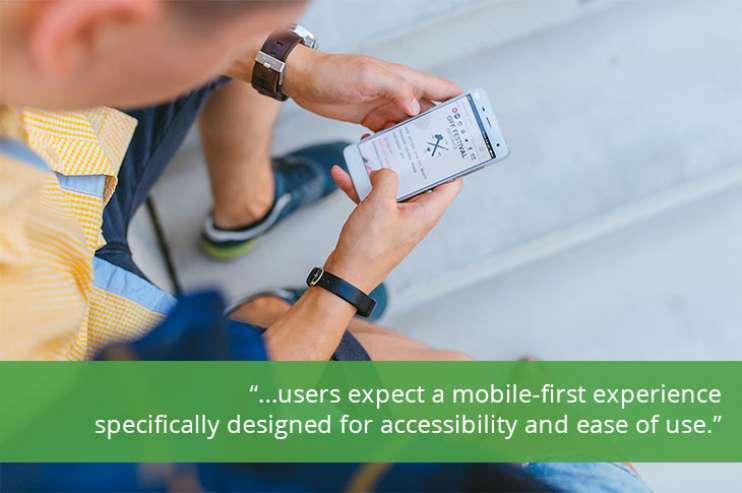 But today, users expect a mobile-first experience–one that doesn't just work on a hand-held device, but is specifically designed for accessibility and ease of use. By way of a simple definition, a responsive website adapts to the dimensions of the viewer's screen – regardless of the platform, operating system, or device they are using. But a fully responsive design can go far beyond simply scaling down to fit smaller screens. For example, newer developer techniques and technologies can now enable your site to recognize the user's particular viewing platform, display different fonts and images to make the site more readable, automatically adjust features and functionality, and a whole lot more. If you haven't done so already, it's high time for you to enhance your digital presence so that consumers can find your business, explore your offerings, get the information they need, and complete their intended tasks quickly, without even having to think about it. Make it touch-screen friendly: Replace tiny links with larger, clickable call-to-action buttons and drop-down menus that are easier to manipulate when working with a small screen. Optimize your page load times: Use web-optimized images, substitute large documents with quicker-loading PDFs, and avoid embedding videos that require long buffering times. If you must use large image files, be sure to include alt attributes with a few words of descriptive text for visitors who may have lower connection speeds. Establish clear navigational pathways: Keep your homepage and landing page copy brief, descriptive, and to the point so visitors can quickly track down essential information. Consider structuring your site so that they can click through to more-detailed sub-pages once they are ready to move down the funnel. Trade in forms for functionality: Avoid asking visitors to fill out complicated forms or type lots of text to submit inquiries and locate information; consider giving them pull-down menus pre-filled with the most common responses, instead. QA-test before you launch: Not only do we recommend checking pages to make sure they work properly on all platforms and browsers, we suggest using a mobile-friendly webmaster tool (like this one from Google) to identify less-common issues or areas where greater accessibility is needed by users with visual impairments. Don't get behind on your HTML "housecleaning": Periodically audit your site pages and content to clear out dead pages, outdated information, missing images, and broken links before they can derail a visitor's perception of your business and its value proposition. Prepare for ongoing optimization: Make sure your web developers are incorporating analytics tools that enable you to keep tabs on your website's performance, quickly identify potential problems, and continually improve the user experience you provide. A mobile-first digital experience is a must for brands to remain competitive in their respective industries and relevant to their consumers. If you’re looking to incorporate responsive features and functionality into your site, or build a fully adaptive, mobile-first experience from the ground up, Prove’s multi-talented team can assist. Our content, design, and developer teams work cohesively to keep key elements, such as user experience and business goals, top of mind when planning and producing your site. If you’re interested to know how your brand’s mobile digital user experience can be improved, let’s talk.